Welcome to my new novel site. 'Bitter Grey Ashes' is a story of Jon Irenicus. Of how I feel it may have ended in one of the many alternative versions of the future. It all started with Dave Gaidar hosting a quiz in the Attic, asking us to write our version of Joneleth and Ellesime story. I did not like Irenicus at all, but tried my best to imagine how it all started ... The more I wrote about him the more involved I got, until I cannot stop myself from imagining how it could have turned if it did not end with that last battle in Hell. Then I just happened to download and play through the Ascension Mod (by Dave himself) in which Jon makes one last appearance. Gods was I surprised! Then I thought - what if?! And this resulted in me writing and coding a new Mod called Redemption, in which Joneleth is given his last chance at redeeming himself. If you are interested, you can find more material on this Mod at : REDEMPTION site. The new mod is called THE LONGER ROAD will give you Irenicus for the entire ToB part of the game, and new extended storyline is coming soon. After Mod was written and coded I still felt it was not finished. I sat and I tried to write few new sentences for the epilogue, and suddenly it turned out as a first person narration. If you have read my other story, you know it is a narrative, but that was easier to write since the heroine was female. Writing from Jon's POV is not easy, but it sure is a lot of fun! I do have a very interesting plot in store for this novel, and I definitely hope you will find it as entertaining as I am to write it. The story is taking place after the events of the Throne of Bhaal and is expanding into the present time Forgotten Realms reality. It is going to be linked to the events of the novels: 'Evermeet the Island of Elves', the 'Archwizards' trilogy, and the Neverwinter Nights game plot. THIS STORY IS A WORK IN PROGRESS - I POST A NEW CHAPTER EVERY 2-3 WEEKS, OR SOMETIMES MORE FREQUENTLY. CHECK BACK PLEASE. I WILL CERTAINLY POST NOTIFICATION HERE ON THIS PAGE WHEN THE STORY IS FINISHED. FOR NOW I PLAN FOR 100-120 CHAPTERS. THERE IS PLENTY OF TIME - I AM NOT THAT OLD YET! 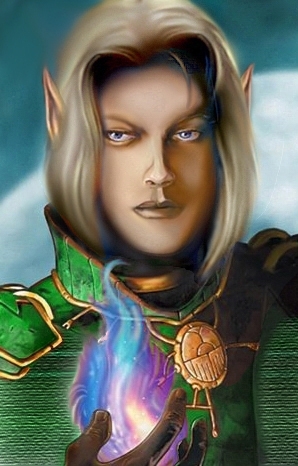 Quick commentary on the new front page portrait -- this was made for the Longer Road mod and the Ashes courtesy of XVIII - the artist from the Forgotten Wars Forums community. The next chapter is being written, and I promise more frequent updates as soon as the Longer Road mod is out. Anthony Burgess, The Clockwork Orange. "The trees of home are burning..."
Please be aware that I answer all emails - unless the return address is incorrect. I apologize - but I had a few answers return because of it. The adds that you see come from Motigo counter. I am trying to get rid of these by switching to google counter.